What is your favorite moment or section in the piece? My favorite aspect of the piece are the songs. I love how they carry the narrative of the piece forwards while zooming in to develop a moment or character. Creating these songs has been a departure and risk for me, which has been exhilarating. How did working in the 80 turk space shape and affect this piece (or not)? I’m a self-help junkie and have wanted to create a piece about the theme of self-improvement for a while. 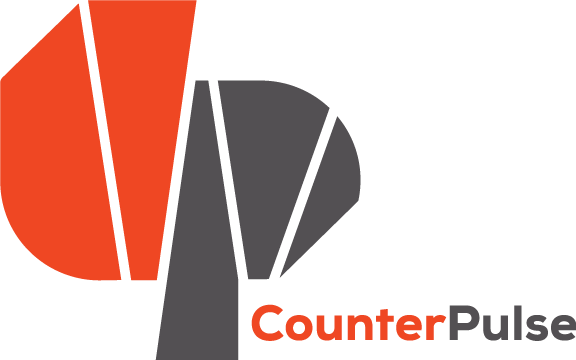 When I heard CounterPulse was upgrading to a new theater, I thought that this was the opportune moment to present this idea because the theme of the piece is so well paired with the renovation that CounterPulse is undertaking. We actually have never rehearsed in 80 Turk although I have been very impacted and influenced by their construction process. The musical we created reveals the demolition and destruction that has to be done before renovation happens. It also acknowledges the universality of struggle and trauma while illuminating the openness and strength found after reconstruction. What was the creative process like? Did you write most of the text and the songs before working with the dancers or in collaboration with them? The process has been very collaborative. I wrote 2 of the song lyrics with the performers and 1 of the song lyrics with Ben, the composer for the piece. As a director I really believe that the collaborators have to be involved in creating the material to feel connected to it. We started the process in one-on-one rehearsals. Our first task was to write ourselves a letter identifying what our inner work is and what we’d like to change about ourselves in the next year. From there, we chose one aspect of ourselves to focus on for creating the material for the show. All of the movement vocabulary and concepts have been generated through a multi-step process of instigation→ translation → reflection → revision → composition → revision → reflection, etc. It could be a never ending conversation…Our collective aim for this work is to create vulnerable material that is universal and to research our fears and move on from them. What are some of your biggest influences and inspirations? Artistically, I am influenced by people who take big risks and are unapologetically themselves. I am inspired by people who are pioneers and trailblazers, by people who open up a whole new avenue of expression or way of working. Diana Vreeland. Christopher Guest. Crystal Pite. Prince. Josephine Baker. The piece is billed as a musical about self-help. What drew you to work in this form? I LOVE musicals. In my fantasy world, we would fluidly fall into choreographed song and dance all the time during the day with both friends and strangers. Additionally, the performers in the cast are incredibly versatile and I wanted to create the piece in a format that would highlight their strengths. You describe the piece as “maximalist surrealist” (maybe I am making this up? I remember reading this language somewhere but now I can’t locate it). I am curious about how this style is translated through the body – what does it mean to make a maximalist surrealist dance? The piece also walks a line of realism and in some ways is extremely human and vulnerable. What made you decide to embed these moments in the work? To bring in balance and to reflect reality. When I go to a show and see incredibly vulnerable material, I relate to it and often feel a sense of relief knowing that other people experience the same emotions and circumstances. Art to me is about connection. It’s important to me to convey reality even in the theatricalized container of “a show” because here we all are, together. A choreographer! I’d love to choreograph for a Broadway musical or film. Photo of Greyarea on Mission and 22nd where the premiere will be happening.